Provide online access to some or all of the 11 video training modules to each of their employees. Test each of their employees / students online and provide completion certificates for successful tests. Track employee progress for both the online viewing and testing processes. 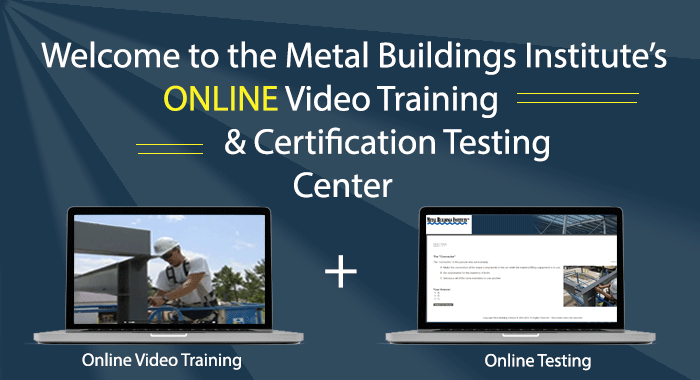 Produced by the Metal Buildings Institute, MBCEA is offering an eleven module online video training program series. These videos were created by Erectors for people involved in the construction of metal buildings. The training series has instruction in both English and Spanish. A listing of the training modules are below. Buy Videos once - Reuse again and again for all your employees. Videos are instantly available to your student / employees upon purchase completion. Any tests that have been assigned to them by their company admin. Each test question can be both read and listened to. Tests may be taken from any computer with an Internet connection. Each module test costs only $10 per employee. For that $10 fee, a student may test as often as necessary until they pass a particular module. A Certificate of Completion will be provided to each student via email after they sucessfully pass that module. If a student fails to pass a particular module, they will be given additional tests for that module, untill they successfully complete it.